I am in a reminiscent mood. And, it was time for another picture on the blog. So, I opened my "pictures" folder and kept coming back to this one. As I sit and look at it, I remember exactly when it was taken. It was right after our first "Labor Day Reunion"that we had at the state park. I still have the T-shirt I'm wearing - signed by all of the people in attendance. And this.... this was my dog. Milaka. I adopted her in the early 1990's, and she was a puppy when we moved to Tennessee. (I'll have to share THAT story sometime.... Talk about forcing one's self across a state line!). I was living and working in North Carolina. My lab, Sebastian had died several months before, and I was living - dogless - with two cats. It was time to begin again with another dog. 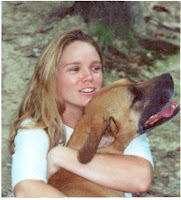 A woman that I knew told me of these beautiful dogs: Half Great Dane, Half English Mastiff. BEAUTIFUL dogs. I got two - one for me and one for my ex- (with his permission!). I digress... together we moved to TN, then to the womb house, then to the married house. In and out of life with her brother, Beauregard. Years of traveling, of moving, of growth and of change. Unfortunately, she didn't live to the current house. She died in early May 2005.... a week after our separation. At the moment I knew she would need to be put down, I said, aloud, "Oh, God, you (the dog) are not going to walk through this one with me...." I was truly 'on my own'. Sure, his two dogs were still living with me, but it wasn't the same. Milaka and I had moving, grieving history together. I felt the loss.... deeply. Retrospectively, I think without her living beside me, I was better able (AKA "forced") to rely on God during that time. There was much grieving - grieving my marriage, "grieving the wish" and grieving for my dog who had spent the previous thirteen years beside me. Thank You, God for the gift of Milaka's presence in my life.